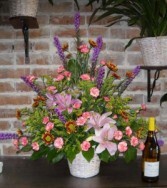 A bright, full arrangement in pinks, purples and yellows. 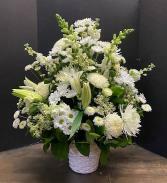 We've used a nice assortment of garden flowers in our white washed wicker basket. 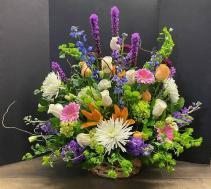 This arrangement, created in a wood-splint basket is a wonderful tribute. It features a mixture of our button and cushion poms, shown here in yellow and white, with larkspur added for airiness and height. A touch of statice is added for color and texture. An autumn themed basket. With it's strong bright colors this style of basket is typically thought of as masculine. The mixture of oranges, golds and reds are enhanced with touches of deep purple to make the colors pop. This basket has a wildflower feel about it. 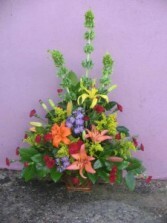 Bells of Ireland lend height while a mixed palette of lilies brightens the arrangement. Burgundy mini carnations and purple Monte Casino asters add interest. A beautiful masculine basket. The autumn colors are available throughout the year, although the cattails featured here may have limited availability. A touch of curly willow would also work beautifully. 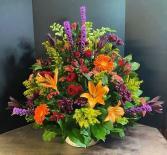 Brilliant jewel tones.A wonderful way to portray a celebration of life. 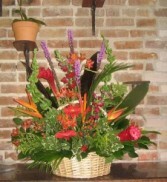 This handsome basket includes a bright mix of tropical flowers and foliages. 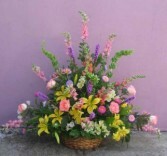 This lush garden flower basket is brimming with snapdragons, lilies and fragrant pink roses. 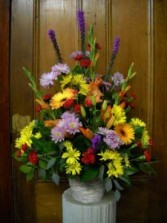 Ask us for our daily listing of dutch and garden type flowers to include in your tribute. Soothing pale pastels spill gently from this wonderful tribute. We've used a garden's worth of blooms, including, stargazer lilies, hydrangea, snapdragons, stock, bells of Ireland, delphinium, and larkspur. This elegant basket was part of a family grouping. 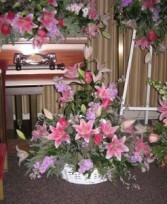 All of the floral arrangements from the family were coordinated and gracefully displayed on and around the casket. Should you care to have an ensemble such as this, our skilled, experienced designers will help you choose just the setting for your loved one. A wonderful basket of bright colors. 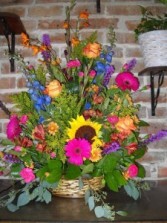 We will choose the freshest, most colorful of our flowers to create this handsome basket for your floral tribute. A wonderfully bright basket of garden flowers. This basket is a beautiful tribute to your loved one. 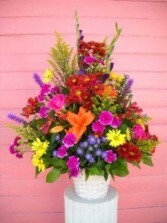 The wonderfully bright and colorful blooms make this a beautiful celebratory basket. Lovely pastel shades fill this natural wicker basket. 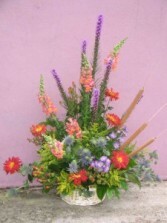 We've included liatris, snapdragons, lilies, gerbera daisies, alstroemeria, larkspur and limonium. 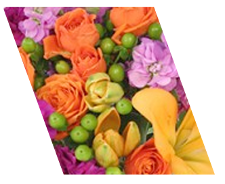 We can easily create the same look for you with similar flowers.